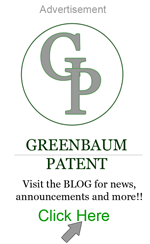 Inventing is a Numbers Game - Greenbaum P.C. I meet a lot of inventors that are certain they've come up with "the one." The one, great idea that is going to be a huge market success. The one great invention that is going to be so wildly popular they will never have to work again. The truth is that most inventions are not a commercial success. Even the inventions that are profitable are often not so profitable that the inventor can retire to a life of luxury and live off licensing royalties. Making money as an inventor requires a more diverse approach. My recommendation to inventors is to keep inventing. I promise that if you've thought of one winning idea, you can come up with more. The key is to define a problem. Once you have defined a problem the answer will often present itself. Another way to come up with ideas is to browse through the patent literature. Google patents is a user-friendly database that will give you access to almost every US patent out there. Pick a topic and start reading and your ideas will sprout. The thing to remember is that inventing is a numbers game. The more inventions you patent the greater the chance of becoming profitable. Rember, one hundred $10,000 ideas is as valuable as one 1 million dollar idea.